The attractive texture used to create this colorful set of return address labels comes from mesh jerseys worn by athletes. Of course, the design of those uniforms is meant to be roomy and allow air to flow though the material. You don't want to be constricted when you're competing on the playing field. This handy product will also give you a little extra flexibility in your daily routine. Since our labels are printed with a self-adhesive backing, you can eliminate the need to scribble out your return address on every piece of mail. Just peel and place on each envelope - then move on! 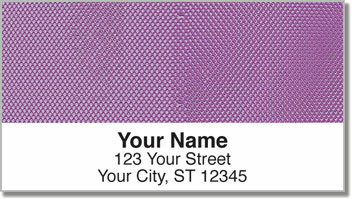 Get your very own Mesh Address Labels today! Order them with a set of matching checks.